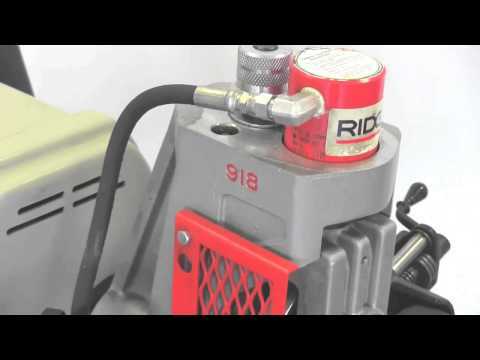 The RIDGID® Model 918-I Roll Grooving Machine is capable of grooving 1" to 8" schedule 40 and 1" to 12" schedule 10 pipe faster than any roll grooving machine in its class. Powered by a 1⁄2 HP universal motor and heavy-duty transmission, it produces high quality grooves consistently and effortlessly. Comes standard with a rugged wheel stand built for mobility in the shop without compromising stability. The stand’s tray is tough enough to support 200 lbs. Features a custom-designed, two-stage hydraulic pump that minimizes pipe flare, operator fatigue and hydraulic fluid leaks. Powered by a 1/2 HP universal motor and heavy-duty transmission, it produces high quality grooves consistently and effortlessly. Comes standard with a rugged wheel stand built for mobility in the shop without compromising stability. The stand’s tray is tough enough to support 200 lbs. Features a custom-designed, two-stage hydraulic pump that minimizes pipe flare, operator fatigue and hydraulic fluid leaks. Capacity 1" - 12" Schedule 10 steel and stainless steel. 1" - 8" Schedule 40 steel and PVC. 2" - 6" copper (types K, L, M & DWV). 1 1/2", 2 1/2" -4" Schedule 80 PVC. Motor Universal, 45 RPM (no load). Approved by CSA to CSA and UL standards. Motor Control On/off heavy-duty with foot switch. 49217 - Groove Roll 2" - 6"
51432 - Drive Roll 2" - 6"
Note: Do not use to groove 8" schedule 40 steel pipe harder than 150 Brinnel. 918-I Roll Groover is rated 5.0 out of 5 by 1. Rated 5 out of 5 by ydoss321 from This product is great! Very easy to work with! Great all around! I wouldn't trade mine for anything!